As mentioned before, now we shall try to get rid of the upper depletion mode Triodes, err… N-Mosfets, those of the depletion mode type, DN2540, and replace them with a single, “ordinary” (i.e. 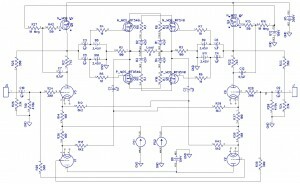 enhanced mode) N-Mosfet. Actually, this new setup is even simpler, but has a drawback: it requires yet another voltage, approximately +155V, and well filtered at that. It also seems to be not immediately apparent how to cascade it. But the positive side is that you can now consider any off-the-shelf, high voltage enhancement mode n-mosfet. Make your pick and tell me what you chose. Within this new design, each of the two high voltage n-mosfets, serving as a modulated Constant Current Source, is implemented in such a manner so that their gates are biased with a **fixed** bias voltage of c.a. +155V. This would imply, that when quiescent, the source of the mosfets, which also happens to be the output of the Alan Kimmel Mu Follower stage, will be centered at a few volts lower, probably +150V, with a target of roughly 1/2 of the B+ voltage. The AC component, as “originating” from the anode of our tube, is fed from under the respective load resistor (R21 or R22), via a coupling capacitor ( C7 or C12 ) and into the gate of the respective mosfet. The 150 ohm resistors at the gates (R42, R15) are just anti parasitic resistors. The AC voltage of the ‘source’ pin of the mosfet will move in phase with the AC signal of the ‘gate’ pin. As this is a follower configuration, so the amplitudes of these AC voltages will essentially be the same. Moreover, this AC signal on the ‘source’ pin will ALSO be in-phase and of ~exactly the same amplitude as the AC voltage on the bottom side of the load resistors (R21, R22). Incredible as it may seem, but the voltage across the load resistors is ~CONSTANT. It practically does not CHANGE AT ALL. What we have here is a constant voltage across a constant resistance, so, therefore, we have a constant current flowing through it. A constant (DC) current source. 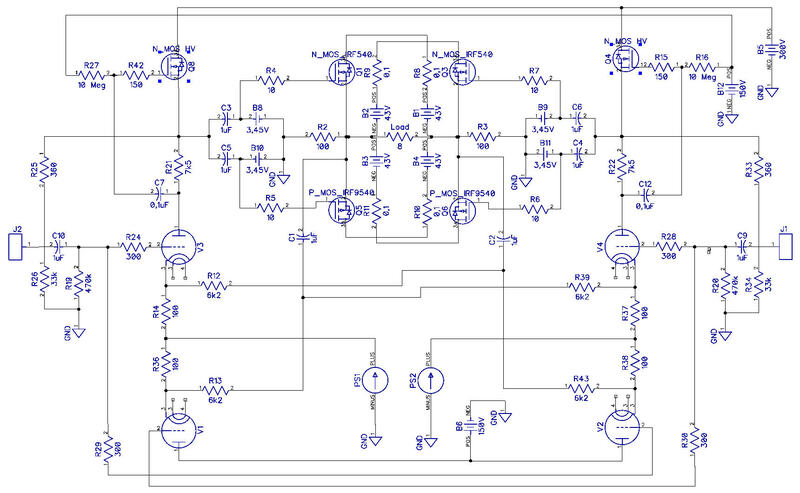 All of the trans-conductance of the mosfet is used in this circuit solely for the purpose of hammering down the AC output impedance of this stage. Any suggestions as to what type of n-mosfet to choose ? It should, be capable of coping with the full B+ voltage, so it would be nice if it does not blow sky high at voltages of up to 300 Volts. Any suggestions, anybody ? The current is not an issue here, as we are probably talking about something in the range of from 10 to 50 mA, depending on how we fine tune the circuit. And oh, and B.T.W. … This supposedly issue, or “problem”, of different voltages: +150V, +300V …. is not such a great issue, as it may initially seam. If we think about it, there is a way to cheat and cut corners. We can get all of these voltages off a single transformer winding. Just need to use some out-of-the-box thinking and add, use, a few extra rectifier diodes and caps. I deliberately do not want to call the center line of these supplies as “0 V” but rather “Center” … because the “0 V” would be misleading. These lines have obviously NOTHING to do with any GROUND or COMMON whatsoever. Just think about it. They are directly connected to the respective speaker OUTPUT TERMINALS. This means, that if your speakers are happily jumping around and rock-and-rolling, so are these symmetrical floating power supplies. They are also happily jumping around and rock-and-rolling (in anti-phase to each other) - as they “sit” on the output speaker terminals that power your speakers. Funny: “Jumping Power Supplies” … If I were to be totally cynical, I would go a step further … Instead of connecting the speaker to the speaker terminals, I could just as easily connect the speaker between the “Center-Commons” of these two “Jumping Power Supplies”. Just imagine: you could just as easily, fully equivalently, connect the speakers to the “minus” poles of the rectifier filter capacitors within these “jumping power supplies”. The result would be identical: Music. Hard to envision, … but true. Oh, and one more thing …. If you are considering a STEREO system, then you need two pairs of such jumping power supplies. That means that you need to build FOUR independent, floating, symmetrical supplies to power a stereo system. Is it worth it ? I dunno. Till recently, I only did it on jumping vacuum tubes. The results are pleasing.